The new hot tub has been working well since early December. And we have been approved by the department of health. But this project has been fraught with unforeseen complications and it hasn't stopped yet. We have experienced unexpected problems with the foundation, piping, heater, pumps, wiring, circuit breakers, etc... Each problem required investigation, sourcing and remediation. Each time that happened, it often took weeks to get an expert to give us the solution and then a further wait for parts to arrive. I was asked this week when I thought the hot tub would be open. My answer was "last June". I honestly believed that. But we have run into so many weird and unusual issues with this project that everyone involved is frustrated beyond belief. 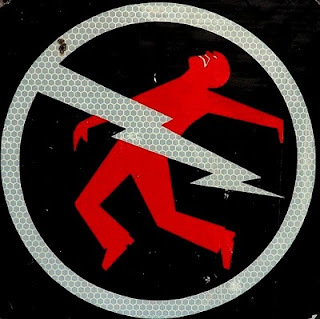 And now... (drum roll)... we have a problem with... stray voltage! Many of you will remember that getting into the old hot tub while holding the hand rail sometimes resulted in a mild electric shock. It was happening well before the park become Bare Oaks Family Naturist Park and everyone assumed it was some sort of static discharge. But with the new hot tub, the problem became much more significant. While working in the new hot tub filled with water, we occasionally got painful electric shocks. Regular electricians couldn't explain it so we hired an electrical engineer to find the problem. It took nearly two weeks to determine that the problem is not on the property. In fact, when we shut down the power to the park at the street, there was still voltage running through the hot tub. We have contacted Hydro One and they are going to install metering equipment to try and figure out where the stray voltage is coming from. So how much longer? It all depends on Hydro One's ability to find and fix the problem. In the meantime, we have been advised that the voltage levels are significant so it is too risky to let anyone use the hot tub. Other than that, the hot tub is working very well. The water is hot, the jets are powerful, and the room is warm and comfortable. But getting into it is a shocking experience that could kill you. Note: while many of the articles above indicate that stray voltage is frequently an issue with local wiring, it is not in our case. By shutting off the electricity at the street, we concluded with certainty that the stray voltage was coming from outside our property.